Of course, this warranty does not cover normal wear and tear. We will assess the fees involved and will let you know once we receive it. The Omni-Dok is also under Olight's 5 year warranty. Buy More Save More. NITECORE NL1485 At-A-Glance. · 850mAh 3.7V 3.15Wh. Capacity: 2800mAh. Battery Model: 14500. 10 x 14500 Batteries. Low reoccurring operation cist, Short -circuit and over-current protection. Battery Type: Li-ion. Keep in a dry and cool place. Suitable for flashlight torch and headlamp, etc. Sanyo 800mAh Lithium-ion Battery Cell 14500. Great for flashlights, lasers, and many other devices. You will receive 2 batteries. Standard Charging Circuit. Charging Circuit. Standard Discharging Circuit. Great for flashlights, and many other devices that require a high amp output. 6.5 amp continuous and 9.75 amp pulse. Safer than the regular lithium batteries. These are lithium manganese. You will receive 2flat topbatteries. The NITECORE NL1475R is a 750mAh 14500 micro-USB rechargeable battery that's compatible with multiple 14500 flashlights, headlamps and other electronic powered devices. No charger is needed to recharge this battery, it's equipped with a built-in micro-USB port that allows users to charge the battery directly using any compatible USB power source. Yet, the battery does have the ability to recharge using a traditional charger providing multiple recharge options for users. The NL1475R is equivalent to 500 pairs of non-rechargeable batteries and has a life span of over 500 recharge cycles, helping to reduce the cost of energy to users over time.Package Contents: NITECORE NL1475R 750mAh 14500 Micro-USB Rechargeable Battery. Of course, this warranty does not cover normal wear and tear. The Omni-Dok is also under Olight's 5 year warranty. We will assess the fees involved and will let you know once we receive it. Buy More Save More. Capacity: 2800mAh. Battery Model: 14500. 2 x 14500 Batteries. Suitable for flashlight torch and headlamp, etc. Low reoccurring operation cist, Short -circuit and over-current protection. Keep in a dry and cool place. Nominal Capacity 800mAh. Lithium CR123A, CR2, 1/2 AA. SLA (Sealed Lead Acid). LiFe Single Cells. Standard LiFe Batteries. Tech / Single Cells (ALL). 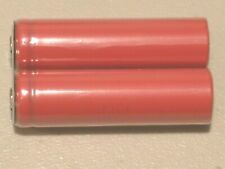 Li-Ion Single Cells. Li-PO Single Cells. Battery capacity: 1200mAH. Do you want the economical and greener lifestyles?. Except that, it features extensively long working life and high efficiency, great for use. Battery color: Blue. DO NOT dispose in fire or heat. Except that, it features extensively long working life and high efficiency, great for use. Battery capacity: 2800mAH. DO NOT dispose in fire or heat. each Weight: 17 g / 0.6 oz. EBL Battery. Capacity: 800mAh. Power Tool Battery. Cell Phone Accessories. 1 Stable battery storage case. 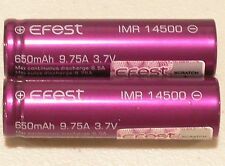 (Battery Model: 14500. Low reoccurring operation cist, Short -circuit and over-current protection. Battery Size14500. Battery Type: Li-ion. excluded.). Keep in a dry and cool place. Our Office Hours Are . Li Ion battery can cause serious personal injury, can catch fire etc if not handled properly. Battery Specifications Arcitec Models: 1050X, 1059X, 1060X, 1090X there may be others that will take this battery - we do not have a master list. Capacity: 2300mAh. Weight: 18g / pcs. Capacity: 2800mAh. Battery Model: 14500. Low reoccurring operation cist, Short -circuit and over-current protection. 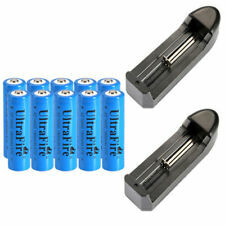 Quantity4PCS Batteries. Battery Size14500. 4 x Batteries. Battery Type: Li-ion. Keep in a dry and cool place. Low reoccurring operation cist, Short -circuit and over-current protection. Battery Model: 14500. Battery Type: Li-ion. Plug Type: US. 10 x 14500 Batteries. Keep in a dry and cool place. Batteries rated at 900mAh's. (3.6 3.7 volts). Usage of this battery is at your own risk! · DO NOT short circuit intentionally or unintentionally. · DO NOT use force to install or install in reverse/backwards. Fenix Authorized US Seller. Fast Shipping from USA. Capacity: 2800mAh. Battery Model: 14500. Low reoccurring operation cist, Short -circuit and over-current protection. Battery Size14500. 10x Batteries. Battery Type: Li-ion. Keep in a dry and cool place. Model No. : US14500VR2. Capacity: 680mah. Made in japan. Battery capacity: 1200mAH. This battery has an extra long life for all your battery powered devices. New battery. High energy density, long life battery. Battery color: yellow-green. each Weight: 17 g / 0.6 oz. IMR14500 Button Top Battery. We love to pair it with the NITECORE EA11 or NITECORE MT10A flashlights. NITECORE 14500 Battery for NITECORE EA11, MT10A and More! Fits many AA compatible lights like the NITECORE EA11 and MT10A. Great for flashlights, toys and many other devices. You will receive 4 batteries. Better longer lasting batteries than those rated with much higher mAh's. Battery capacity: 1800mAH. Do you want the economical and greener lifestyles?. Except that, it features extensively long working life and high efficiency, great for use. Battery color: Blue. Storage temperature:-20 to 60 degrees Celsius. Continuous discharging current: 1.5C(maximum). Continuous charging current :1C(maximum). Standard discharging current :0.2C. Standard charging current: 0.2C. Capacity: 2800mAh. Battery Model: 14500. 10 x 14500 Batteries. Low reoccurring operation cist, Short -circuit and over-current protection. Keep in a dry and cool place. Battery Size14500. Battery Type: Li-ion. Batteries rated at 900mAh's. (3.6 3.7 volts). 3.0 volt and 4.20. - LED indicator shows current charging status. Capacity: 2800mAh. Battery Model: 14500. Low reoccurring operation cist, Short -circuit and over-current protection. Battery Type: Li-ion. Keep in a dry and cool place. ● We will reply in 24 hours and solve your problem in a friendly way. For high drain devices such as Nitecore flashlights or. 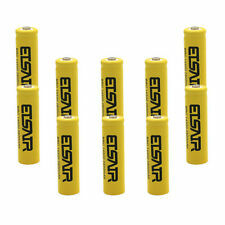 · 850mAh 3.7V 3.15Wh. · High performance battery for high drain devices. Included in the Box. Of course, this warranty does not cover normal wear and tear. We will assess the fees involved and will let you know once we receive it. The Omni-Dok is also under Olight's 5 years warranty. Buy More Save More.